Streaming live local events, not big enough to be covered by traditional broadcast mediums, sounds like a great idea. The question, is there a logical business model to support it? YourSports.com thinks so and they'll be re-launching their site with a new model in mind: crowdfunding. In doing so, they hope to "eliminate the away game." Crowdfunding is where fans finance the production of games they want to see. If enough fans buy tickets before the deadline ends, the game gets broadcast online. If not, the game is blacked out and fans end up paying nothing. Think of it as pay per view, but only if there are enough people that want to see a particular game. They'll start with some of the greatest games every played in NCAA history and then plan to air high school and NCAA division II and III games. Allowing many of these sports properties to monetize their broadcast media rights for the first time. 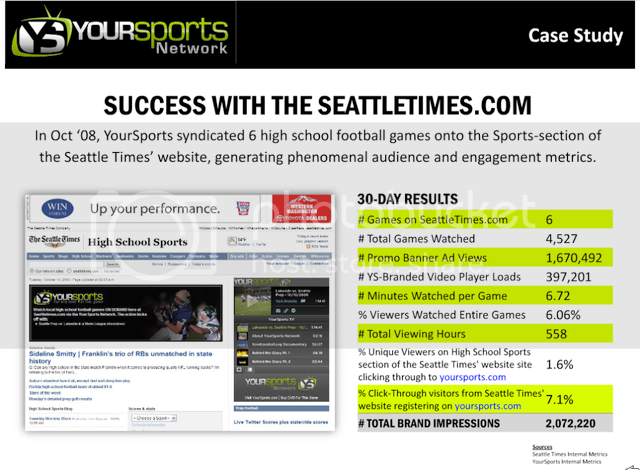 YourSports has partnered with local media outlets, like the Seattle Times, to gain a wider audience and extend opportunities with local advertisers. Can demand-side economics—be a solution to getting local games online profitably and legally? If they can prove pre-paid demand then the theory is that local, and even national sponsors, may be willing to step in and crowdfund local passions by themselves, thereby letting the fans off the hook. In exchange, sponsors will get pre-rolls, the opportunity to brand video players, create co-branded landing pages and other assets. Yoursports.com is not alone in trying to unlock local sports. Traditional media companies (espn, fox sports net, etc.) have all put a concentrated focus on high school sports and startups like the Wazoo Sports Network have launched similar offerings around local live content. And why stop at sports right? There's no reason why these new models around live content could not extend to concerts, festivals, fashion shows and more. What do you think? Will enterprising sponsors be willing to take the leap on live local sports?